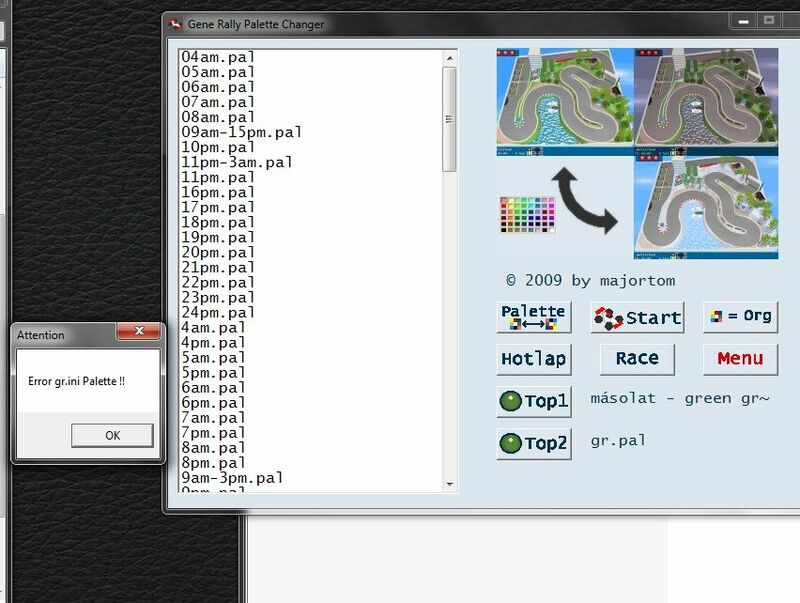 The program changes the GR-Palette in a simple way. Additionally, a preview is shown, if available. Edited by Trigger Happy: the link to file is deleted because there are missing any credits or readmes of the palettes now. This is not an update, I suppose? I mean, If I have the RSC/PlanetGeneRally version, there's no need to download this one, am I right? Please don't visit my GeneRally "website", it hasn't been updated since 8 years, and there aren't any new tracks!! I bring it back because RSC is down. In the moment I explore some savegames with a Hex-Editor to understand the structure. BTW I would like to point out that the zip containing the program contains also a folder with many palettes which were posted on RSC. None of those palettes have the readme file included and therefor they cant be re-distributed. Even though many palettes have the written permission (you cant see that because the readme files are missing but I know that from other sources) to be re-distributed, they must be distributed in the original zip. This is against the rules of this forum (point 6). I suggest majortom to reupload the program without the palettes included. @ majortom: you should not distribute the palettes inside of the file and even more without at least credits for their authors or original readmes as best (the sentence ''These palettes don't come from me. They are taken from the RSC forum. Don´t post them for download anywhere. Nevertheless have fun with it.'' is not enough. ). As the files are not stored at GRRF, I delete the link to download to PlanetGeneRally for now. Feel free to place later to first post another link, when you'll upload somewhere the changer in corrected file, please. I know, there was a problem with the palette files inside the zip. But I found no easy way to create the previews for a existing palette folder. It is the program without palette files, so everybody must create the previews himself. @ MajorTom: Why didn't you just edit your first post, and inserted the link there? In that way, it would be easier to find. Edited by Trigger Happy: the link to file is deleted until there are missing any credits or readmes of the palettes now. It means we have to wait UNTIL the credits are deleted, you'd better exchange the word "UNTIL" with the word "BECAUSE"
Majortom, would it be possible to make a few changes for the Palette Changer? One thing I'd like is when starting your programme, I want it to show a picture of the track with the palette that's presently in use in GeneRally, instead of the standard picture like it does now. Second, Could you implement more (maybe 5, or even 10) pre-selection buttons, for more diversity. And what about the possibility of left-clicking on a palette shows that one in the picture, and double-clicking activates it. Would be nice to hear some reactions from other people too! After installing GR 1.12b, it seems that the Palette Changer doesn't work anymore. Looks like there's a conflict with the GR ini, see the pic for reference. Maybe it's due to the fact that the palettes can now be changed inside GR and they are in their own folder instead of general GR folder. Thanks for pointing that out, Tuomoh! Pity I can not use these nice previews anymore, had lots of work making screenshots and resizing them. Maybe an option for future GR releases.